Clean water is a basic human right so why spend a small fortune just to enjoy this privilege? 90% (or maybe even more) of us Filipinos don't trust water from the tap so we result to buying water, filters, or boiling it to ensure our family gets proper potable drinking water. Purchasing large amounts of distilled water on a daily basis can be quite expensive when you look at it from a monthly perspective, so is boiling especially with gas prices going up everyday, not to mention a hassle when it comes to boiling, cooling and refrigerating. Kettles can only contain so much and it would take several rounds to fulfill my family's daily water intake. Nowadays, who has time for that? These are a few of the reasons why we opted for a water filter instead. Turns out, I was still barking up the wrong tree and am extremely lucky that none of us has gotten sick due to my false and brash judgment. 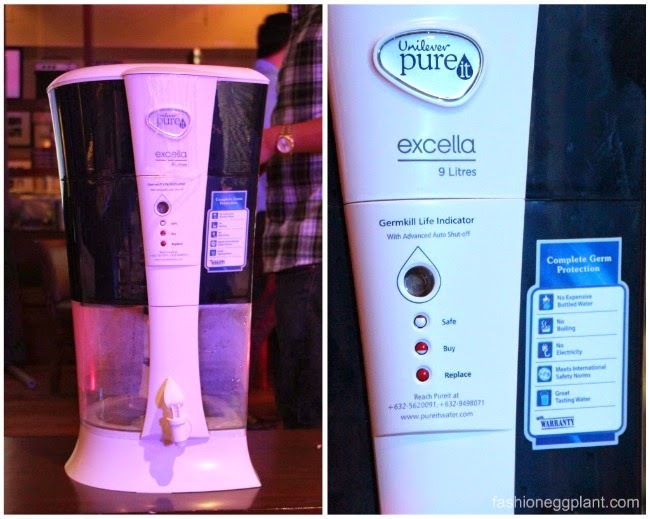 At the Unilever PureIt event held last week, I was informed that a water filter is very different from a water purifier. A water filter only manages to filter out dirt and sediments not harmful bacteria like E. Coli. Used to be that US EPA standard approved water purifiers were really expensive to purchase. Not anymore. Unilever brings Pure It to the Philippines. Pure It is the world's largest selling brand of in-home water purifiers. 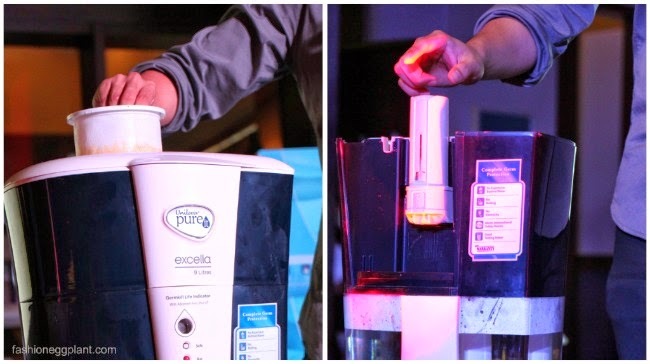 Pureit Excella is the only non-electric water purifier that meets the microbiological safety norms criteria of the US Environmental Protection Agency (EPA), the regulatory body with the most stringent standards for safe drinking water all over the world. It's guaranteed safe to use on newborn babies! PureIt Excella uses a series of filters that provide layers of protection. It makes sure that the water you drink is bacteria-free, dust-free, germ-free, virus-free, chlorine-free, pesticide-free and odor-free. Sounds to good to be true? Think again. 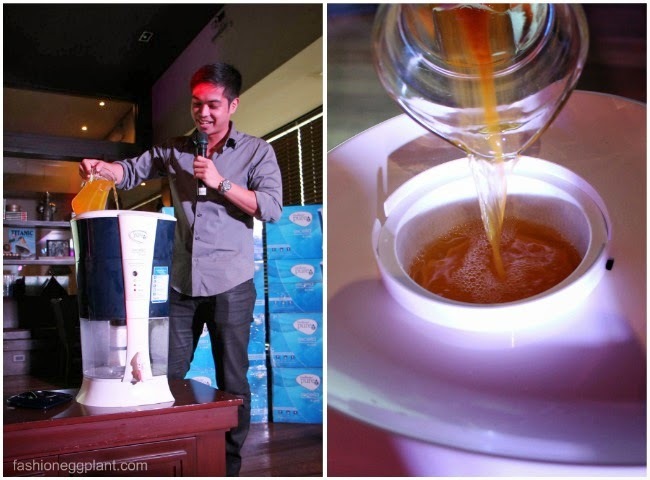 At the launch, a PureIt was filled with a chemical liquid that was made to emulate contaminated water. I personally had a whiff of it and it didn't look or smell very good. They let this "contaminated water" pass through the filters to show us how efficient PureIt is at purifying our water. From a smelly, yellow liquid, out came pure, color-free and odorless drinking water that we all got to sample afterwards. It tasted very clean and fresh. Way better than my water at home. Apparently, merchandisers of PureIt have a hay-day experimenting with their sample units in store. They put all kinds of liquids in there even dirty mop water (blech! I personally wouldn't go that far but it is quite reassuring that it can purify water that is as filthy as that). In times of armageddon or a zombie apocalypse, PureIt can even purify your own urine! It is truly amazing and totally worth it at just P5000/unit. Even better? They sell spare parts just in case you break or lose something like a lever or cover. Assembly is very easy, just a matter of screwing in a filter and layering the different components. 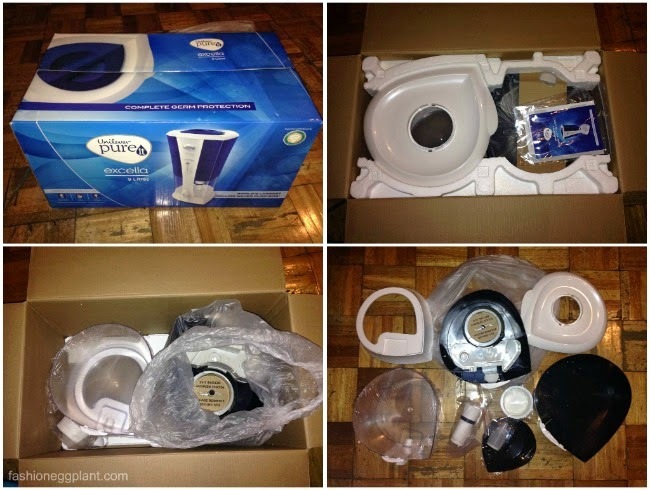 After you put together your PureIt, you need to cycle the water at least 3 times to get rid of the "plastic odor". I had to do mine around 5 times just to totally get rid of all smells. Filters need to be replaced when the Germkill Indicator flashes red. You can purchase a new kit for just P1000. Don't worry, it takes a long time before you need to replace it with a new one. Check out the new Unilever PureIt Excella at True Value, Abenson, Automatic Center, Ansons and other appliance stores nationwide.